Garage pergola kits come in many styles and sizes to accommodate a variety of homes. Add a pergola over your garage door for an eyebrow pergola that spiffs up the exterior of one of the most used rooms in your house – the garage! Or, similar to a carport, large pergola kits can be a shelter used to cover a car or truck instead of a garage. Since pergolas are typically found in garden areas as part of a stylish landscape, this may come as a surprise that two of the top 10 uses for a pergola revolves around our beloved vehicles. Garage pergola kits are a popular alternative to adding a garage, and can be built as a carport with a cover to house a variety of vehicles or other equipment typically stored in a garage. Choosing the size pergola offers more flexibility with the structure and can be built using a variety of coverage options, including detachable wall and top coverings. This can be a more affordable option to protect vehicles without the expense of building a full garage. Another use for a garage pergola kit is a decorative feature above the door of an existing garage. 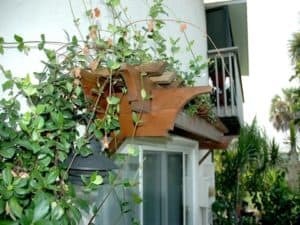 Wood pergolas that are used to decorate the exterior of homes create a natural looking awning that can also be enhanced with vining plants. Giving your home an extra touch of style on an otherwise dead space above your garage is a welcoming sight when you come home from a busy day at work. Sometimes called an eyebrow pergola, a pergola installed above a single, double, or larger garage door adds a design feature to enhance that empty wall space on the exterior of your home. This can also extend the usable area of a garage or shed. When used as a decorative feature for the exterior of a home, a pergola can enhance the look of your home and add loads of curb appeal simply by adding on to your garage door. This type of pergola can be built in various lengths and widths. 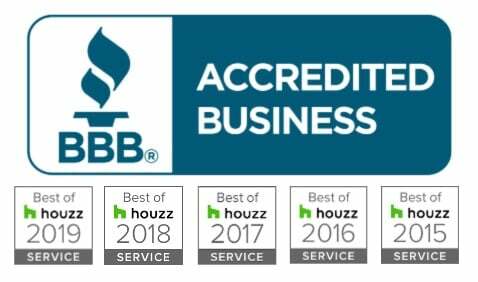 Add some curb appeal to your home and make it more inviting every time you vehicle in to your driveway. Placing a pergola kit above a garage door or on an empty side wall of a garage dresses up any home’s exterior. To determine the size eyebrow pergola to install above your garage doors, measure the width of the garage door frame and add space for the pergola to extend beyond the frame on each side. Since standard garage doors come in single, double, and sometimes triple, the length of your pergola would range between 8 feet up to around 24 feet. The width of standard single door garages to hold one car is 8-9 feet, and the width of standard single door garages to hold two cards is 16-18 feet. Take measurements of your door to determine the size pergola that fits. For example, our Visor pergola comes in standard sizes 3’, 6’, 8’, and 12’. If needed, these standard sizes of garage pergolas can easily be customized for depth and length, to accommodate a larger garage door. These components make this pergola both stylish and functional. Two things that garage pergola kits can provide are style and function. Pergola kits like our Visor pergola provide an overhang over your garage door that lends some protection from the elements, while adding a decorative eave. If the overhang of your house doesn’t extend out far from your house, you can consider adding a garage pergola kit to extend that area. This style pergola also dresses up the exterior of an otherwise plain front to the house. 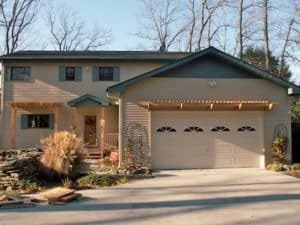 It breaks up the large open wall that the space above your garage door sometimes creates. Another use for garage pergola kits is a structure to house your vehicles. 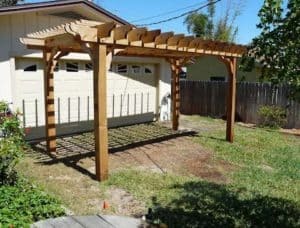 When used to protect the family wagon or other wheeled toys, a pergola is a cost-effective way to build a carport or garage-type structure. Used as a more stylish carport, a pergola can be built next to or in place of a standard garage. 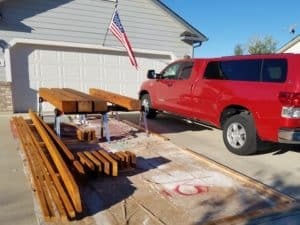 When used as a garage or carport, a pergola kit provides a space to park a car, truck, or other vehicles without the expense of building a garage. With a pergola, you can customize your garage or carport according to your specifications. Extend the length of the beams, and stretch your rafter length to accommodate as many vehicles as you need. Add more top slats for more coverage and choose the shape of your end cuts, and you’ve got a stylish custom carport. Whether you’re looking to add style and function above your garage door with an eyebrow style structure, or build a hand-crafted shelter for your favorite four wheeler, a pergola can be a simple way to finish off your garage!